Jordysghost wrote: Lol I bet your a Moss fan. Oh, Wisconsin, when will you teach your students basic grammar like the difference between "your" and "you're"? The legacy of Scott Walker. Yea, must always remember to uphold the staunch formality of a sports message board. I dont live in WI. You live in the Tower of Babel now, but I suspect you were born and raised in WI. Anyways, Erin's dbaggery shouldn't squelch your fondness for him. He's a heck of a player. Similarly, the fact that Moss did some idiotic things didn't hinder me from being a fan. Last edited by Texas Vike on Tue Jan 17, 2017 12:50 pm, edited 1 time in total. Born, yea, though it doesnt feel like it. Raised? Hard to say, spent alot of time there but spent more time elsewhere. I think Brady is more consistent, Rodgers can get into slumps as we saw this year and in the past. But at the risk of over inflating Jordy's head, when Rodgers is hot, I think he's the best in the game. S197 wrote: I think Brady is more consistent, Rodgers can get into slumps as we saw this year and in the past. But at the risk of over inflating Jordy's head, when Rodgers is hot, I think he's the best in the game. Brady took 7 seasons as starter before ever eclipsing 30 tds, Rodgers took 2, Rodgers has thrown over 30 TDs in his career 7 times, Brady has done it 6. Rodgers has thrown over 9 picks twice in his career, Brady nine times, 3 of them in dating back to 2009. Why weren't people talking about his 'Slumps' those years? Because he doesn't have to live up to Rodgers out of this world production like Rodgers does, he only has to live to Tom Brady production, which is lacking significantly in comparison in quite literally every statistic/facet. All with a better supporting cast, imo. Im not sure how you can call somone more consistant when he simply averages less TDs and significantly more interceptions. Btw, "In the past"? When has Rodgers ever had any sort of slump prior to 2015? He hasnt. Ever. Not similarly. Moss was on a much higher level of d bag, you call Aaron a #### because you perceive him as 'Smug' or 'Arrogant'. Moss is remembered as one of the games most legendary d bags because he was a crying little diva who walked off the field on his own team while a game was occuring. Jordysghost wrote: Not similarly. Moss was on a much higher level of d bag, you call Aaron a #### because you perceive him as 'Smug' or 'Arrogant'. He does, indeed, come off as arrogant. But there's more than that. I don't think it's coincidental that he is on bad terms with his family. You have always exaggerated Moss's weak points. 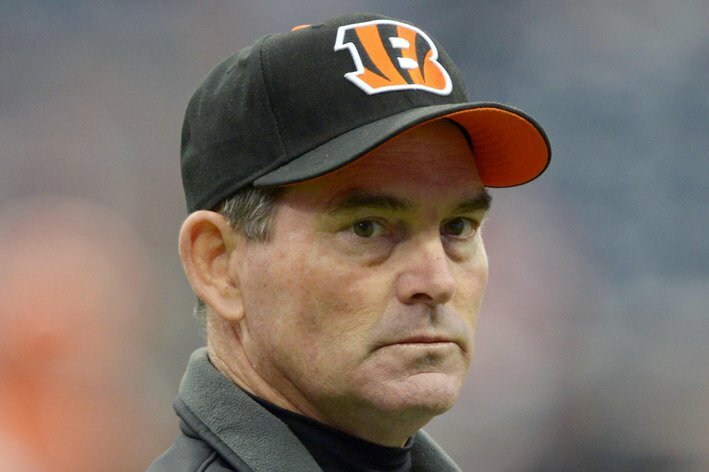 His goal post wipe seems to have offended your very soul. There is nothing to suggest that, your just using it as a lame insult. There are a plethora of reasons to dislike Moss, him quitting on his own team being one of them. Jordysghost wrote: Btw, "In the past"? When has Rodgers ever had any sort of slump prior to 2015? He hasnt. Ever. Isn't 2015 in the past? He had a string of bad games in 2015 and 2016. He missed significant time in 2013 so throw that season out. That's 3 out of the last 4 years. I'm not going to go and dredge up anything before then. I think Brady is more consistent, stats aren't everything and its my opinion. S197 wrote: Isn't 2015 in the past? He had a string of bad games in 2015 and 2016. He missed significant time in 2013 so throw that season out. That's 3 out of the last 4 years. I'm not going to go and dredge up anything before then. I think Brady is more consistent, stats aren't everything and its my opinion. You say "Throw that season out", and then apparently count it as one of his 'Slumps'. 3 of the past 4 years? Dont you mean two of the last 3? Again, Brady's not more consistant aside from at throwing less TDs, yards, and more INTs, the "Slumps" you refer to are only slumps by Rodgers own standard, by Brady's standard, they are still very good seasons. Even in this 'Slump' year, Rodgers just had a better season then Tom Brady has had since going 18-1. Stats arent everything, but considering the vast, vast statistical discrepancy between them, and the fact that Brady has nearly always had as good, usually better a supporting cast, i'd say the stats are pretty hard to dispute in this comparison. You prove an interesting point on Rodgers, anyone else has his last two years and its great, but because Rodgers set his own bar so incredibly high, he is perceived as 'Slumping'. Literally not one other player in history would get as much #### for the years he just had. Last edited by Jordysghost on Thu Jan 19, 2017 11:12 am, edited 1 time in total. Jordysghost wrote: You prove an interesting point on Ridgers, anyone else has his last two years and its great, but because Rodgers set his own bar so incredibly high, he is perceived as 'Slumping'. Literally not one other player in history would get as much #### for the years he just had. It's not just perceived that way by Vikings fans. HOW BAD HAS AARON RODGERS GOTTEN? How bad is Aaron Rodgers playing right now? Pro Football Focus, which grades every play of every game, just gave Rodgers the worst single-game grade of his career. He earned a 33.0 for Sunday’s loss to the Minnesota Vikings. That falls into PFF’s “poor” categorization, which is also their lowest or worst categorization. On the season, Rodgers’ grade thus far is 42.6, also classified as poor. Want to see something even more depressing? Rodgers is playing quarterback at a similar level to the San Francisco 49ers’ Blaine Gabbert. Seems like a slump to me. YMMV. 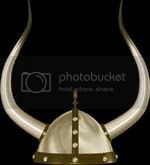 Cliff wrote: It's not just perceived that way by Vikings fans. I never said it was, thats the point, Rodgers set his own bar far too high. Why was Bradys 2013 not looked at as a super ultra mega slump? He had a 25-11 Td to int ratio and an 87.3 rating, Rodgers has never had a season that bad in his life, if 31-8 td to int ratio and a rating of 92.7 is a slump, then Brady has had multiple worse slumps in his career. Point blank, its only a slump by Rodgers own standard, anyone else puts up those years and its a great/good year. Jordysghost wrote: I never said it was, thats the point, Rodgers set his own bar far too high. During that 8 game stretch he was matching Blaine Gabbert's stats so ... sure, by the end of the year he had done well enough to bring his numbers up, but during that window he was awful. 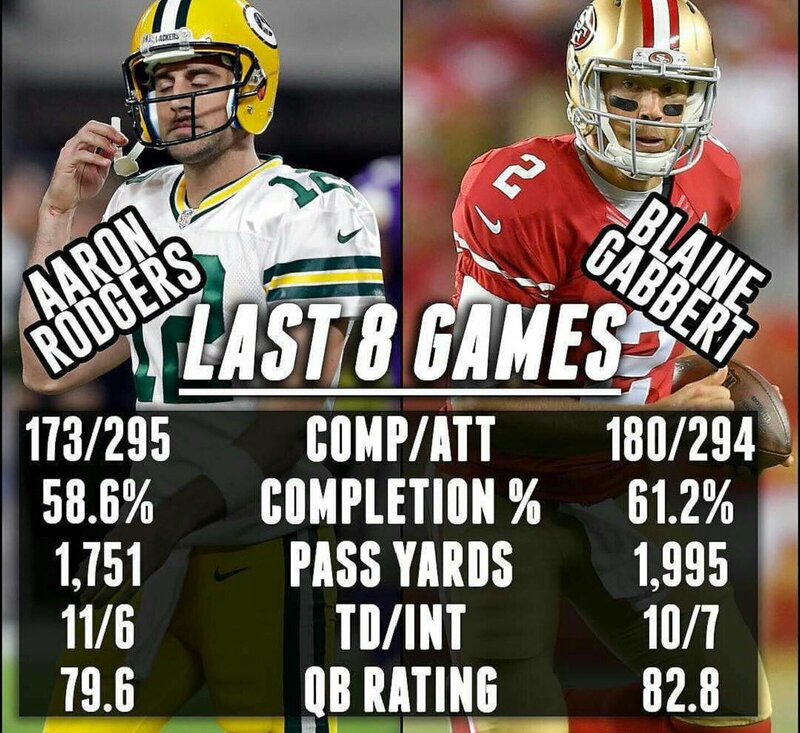 Anyway, it's not all about stats in the Brady vs. Rodgers debate. Setting the stats aside, it's hard to argue with Brady's results. Which one would I take in their prime? That's a tough decision as I realize some of Brady's success is that he's been on superior team to Rodgers on average.